We will have a business meeting on Tuesday, February 13, 2018, at the Roslindale Community Center. At its caucus on this past Saturday, February 3, 2018, nearly 90 registered Democrats in Ward 19 elected the following delegates to attend the State Democratic convention on June 1-2, 2018, at the DCU Center in Worcester. The Ward 19 Democratic Committee congratulates our delegates! Thanks to all the members and volunteers who helped make the caucus run smoothly. Special thanks to Bill Shaevel and Nancy Doherty for planning and running the food table, and to Painters And Allied Trades DC 35 for the use of their hall in Roslindale. Registered Democrats in Boston Ward 19 (Jamaica Plain/Roslindale) will hold a caucus on Saturday, February 3, 2018 at 25 Colgate Road (Painter’s Union Hall) in Roslindale to elect delegates and alternates to the 2018 Massachusetts Democratic State Convention. Doors open at 9:30 a.m. and close at 10:00 a.m. sharp. The caucus will be called to order at 10:15 a.m. Only those who are signed in by 10:00 a.m. can participate. This year’s state convention will be held June 1-2, 2018 at the DCU Center in Worcester where thousands of Democrats from across the state will come together to endorse Democratic candidates for statewide office, including Constitutional Officers and gubernatorial candidates. The Ward 19 caucus is open to all registered and pre-registered Democrats in Boston’s Ward 19. Pre-registered Democrats who will be 18 by September 4, 2018 will be allowed to participate and run as a delegate or alternate. Ward 19 can elect 24 delegates and 5 alternates to the Convention. The 2018 Democratic Campaign Institute is just over a week away, and it’s not too late to grab your tickets now! Tickets are $75 and can be purchased through this link. Celebrate Jamaica Pond Park with our elected representatives! Author Boston Ward 19 Democratic CommitteePosted on January 9, 2018 January 9, 2018 Leave a comment on Celebrate Jamaica Pond Park with our elected representatives! 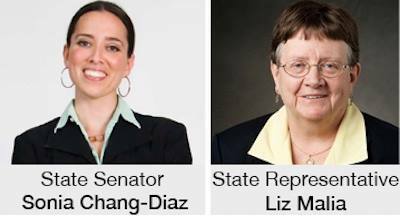 The Ward 19 Democratic Committee invites you to join us for a discussion on criminal justice reform with State Senator Sonia Chang-Diaz and StateRep. Liz Malia! The MA House and Senate have each passed criminal justice reform legislation with differing elements and are currently reconciling differences to produce a final Justice Reinvestment Act. This is an opportunity to talk to your legislators and get a better understanding of the legislative process. We hope to see you there! The meeting will focus on the integration of a new, permanent canopy to provide shelter to waiting riders in the Upper Busway at Forest Hills Station into the current construction contract and how this work will be completed. A year-end report on the progress made at the Casey Arborway Project during 2017 and since the second series of construction meetings in the summer of 2016 will be provided. All residents, abutters, local business owners, and interested commuters are invited to attend.